Phat Sounds from your VCS Console! musical instrument, and using the appropriate keypad controller. Waddya expect? Nicely drawn knobs and slider controls?! how you play the Synthcart! 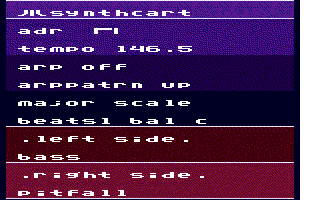 put on his web page, several MP3 Audio tracks of what Synthcart sounds like. So I set to doing some downloading at this point. played at once, with some extra reverb to hand. some people might think that derives from the Atari 8-bit 'Pokey' chip? overlays  if  you  are able to build and burn the  cartridge  for  yourself. tape-based  playback system,  somewhat like the 1960's 'Mellotron'  concept! level of mediocre, and makes them great! CiH, for Alive! Mag,Nov '02.